Blog-checking lines: Rachael of pizzarossa was our August 2012 Daring Cook hostess and she challenged us to broaden our knowledge of cornmeal! Rachael provided us with some amazing recipes and encouraged us to hunt down other cornmeal recipes that we’d never tried before – opening our eyes to literally 100s of cuisines and 1000s of new-to-us recipes! This month's challenge was to use cornmeal in a new recipe. What a great challenge so many choices I decided on a new cornbread recipe that used some masa flour which really imparted a lovely Tex-Mex flavour to the final bread. This is a recipe that I haven't tried before it uses yellow cornmeal, yellow lupin flour and blue cornmeal flour with some oat bran for extra flavour. 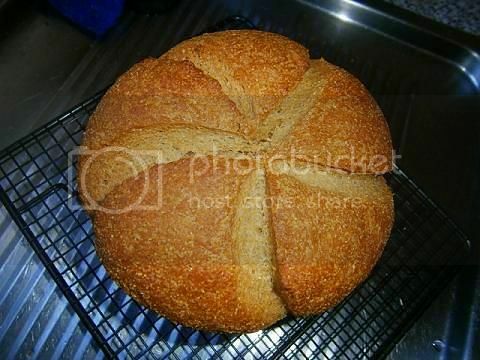 The recipe produces a very light and airy loaf that produces the most beautiful slashes when baked. And the crumb (the bread's interior texture) is amazing crunchy due to the cornmeal and has that slight limy taste of the masa flour which adds a lot of authentic "Mexican" flavour profile to the loaf. Great with chilli or red beans. 1. Add the yeast in a small bowl with the warm water and oil, rest until foamy about 5 minutes. 3. Add the foamy mixture to the dry ingredients mix then knead about 8 minutes until smooth and elastic. Cover bowl to keep in the heat. 5. Prove in a warm place until doubled in size about 1-2 hrs depending on temperature. 6. 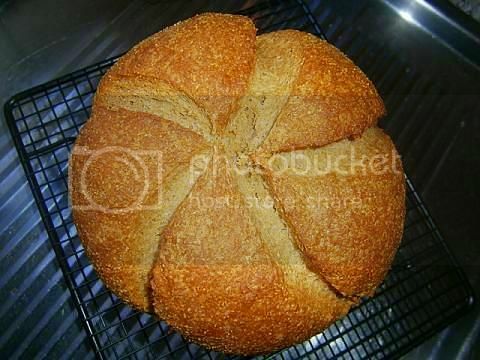 Knock-down risen dough, shape into a large bun. slash with a sharp knife. Cover and rise in a warm place until just about doubled in size (usually half the time of the initial rise). 7. 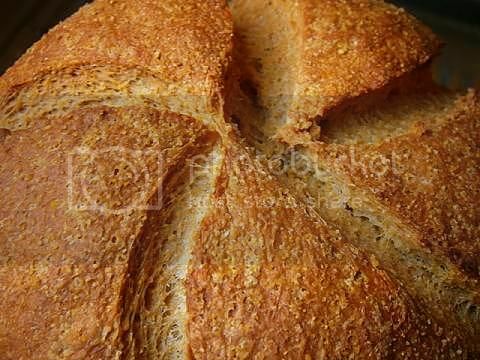 Bake in a hot oven (220C/425F/gas mark 7) for 50 mins with steam for the first 8 minutes (check at 40 mins) until brown in colour and the bottom of the loaf sounds hollow when tapped. Yum! That's a seriously good-looking loaf. I need to get a sharper blade for my doughs. They tend to rip as much as cut when I slash them. Now I'm off to look up lupin flour. We have lupine flowers, but they're poisonous! Audax - that is a beautiful loaf of bread. I am sure it would be perfect with a bowl of chili or toasted with some butter on it. That is a beautiful loaf of bread! :) I love the swirls!! I need to learn that technique! Your bread looks lovely. I had to google yellow lupin flour as I had never heard of it. It will be interesting to see if I'll be able to find it here. That is a beautiful loaf of bread. Well done! 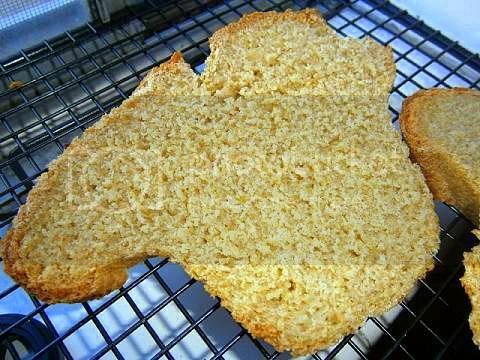 That bread looks just amazing, and I can imagine it with a hot bowl of chili. Sounds yummy! This is an absolutely gorgeous loaf of bread! Great job with this challenge!